A couple of weeks ago we asked for submissions about sound, and you delivered! We received three sound-specific submissions, all of which take a different design approach. It’s worth noting that in spite of these differences, the first two of our featured submissions make use of the red, yellow, green color scheme to denote acceptable noise levels within the library. The last, designed for digital signage, uses large eye-catching text and simple icons to get the message across. The first submission is from Brenda Sevigny-Killen at the Bennett D. Katz Library – University of Maine at Augusta. After our library greatly deaccessioned our reference materials, we opened up space for collaborative study areas with rolling whiteboards, chairs & tables, and comfort seating. To encourage collaborative use of this new space, staff designed signs to promote the new area. We also designed a sign for the quiet area since the multiple tables for 6 falsely encouraged noisy collaboration. There are times when we have to redirect groups to the collaborative zone so this space remains sacred for silent study. This project has been hugely successful and we now find we need much more collaborative space as more and more students find sanctity and camaraderie within the library walls. Another happy side effect is getting to know more of our students and subtly infusing a atmosphere of support, care, and staff dedication which we hope contributes to their success. Brenda’s posters were designed in Publisher and are available in our Google Drive. Erin McCoy at Massasoit Community College in Brockton, Massachusetts submitted designs that she created in Canva. I was inspired by a recent conversation on a list serve to take a look at signs for “sound expectations” – I like the one in the google drive, so I decided to riff on it in Canva for those of us without Adobes or Publisher skills. Our library is one big room, that is square, so it’s hard to place signage and to communicate where the different zones are, so we’ll see how this goes! Kudos to Erin for tackling the challenge of signage for the one-room library layout! You can find the complete set of Erin’s signage on the Librarian Design Share Google Drive. Our final submission is from Lauri Miller at the Paul & Harriett Mack Library in Bethlehem, PA. Lauri created her sign through Google Slides and used icons from one of my favorite resources, The Noun Project. Here is my submission about sound levels in the library. I created it in Google Slides which feeds the digital sign in our lobby. The sign flips between slides, so I tried to keep it brief, understandable, and eye catching the foot traffic in and out of the library. The cell phone icon is by Creative Stall, and the earbud icon is by Erman Tutan. Both are from nounproject.com. Thanks to Brenda, Erin, and Lauri for their submissions. Remember, you can submit your own work to feature or request feedback at any time. All submitted work will be published on this site under a Creative Commons Attribution-NonCommercial-ShareAlike 3.0 Unported license. Do you have a complicated name? Do you have a common name? I bet all of us fall into one or the other category, and that’s a real issue when publishing our research over time. ORCID is here to help all of us with name issues due to marriage, preference, nationality, or maybe just because our parents thought it would be easy to name us something memorable. ORCID assigns researchers a unique identifying number that stays with them throughout their career, thus making it easier to follow the publications of Janie Ngata née Janet L. Ngata-Romero. I was inspired by the University of Adelaide’s flyer design, another university’s flyer design that I can’t locate anymore, and the general promotional materials for ORCID, but thought it would be fun to add a bunch of common last names at the top in different fonts. I used Wikipedia’s “Most Common Surnames” lists for Asia, North America, South America, etc to generate the list. There were a lot to choose from so I specifically chose names that I knew were common at my institution. I love that Sarah used the look and feel of ORCID’s brand, but personalized this flyer with names her researchers could relate to. Sarah submitted both the PDF flyer and a PowerPoint slide to our Librarian Design Share Google Drive, in case folks want to use her version or instead edit the names to better reflect their institution’s researchers. Finally, Sarah used Google Slides to make this flyer, and if you don’t already love Google Slides, you should! Veronica and I use Google Slides almost exclusively to create our presentations, as you can collaborate across distances to make real time updates. Also, you can easily take Google Slides with you on your travels as long as you’ve got an internet connection; or, if you don’t have reliable internet, you can download the slides into PowerPoint format. It’s a beautiful thing. Psst, interested in getting your own ORCID ID? It’s super simple, just go here. With the ALA Annual Conference wrapping up, there are likely several librarians and library school students breathing a sigh of relief after completing a successful presentation. Super proud of your poster? Feeling like your presentation slides were on point? April and I would like to encourage you to submit your poster / slide deck designs for an ALA Conference feature post. ACRL 2015 was amazing, folks. There were so many brilliant, passionate, friendly librarians in one amazing city that I thought my head might explode. Two of those rad librarians were my co-presenters, April Aultman Becker (also co-creator of Librarian Design Share) and Abe Korah. On Friday afternoon we presented a panel on facilitating inquiry throughout the research process and helping students develop thoughtful questions. As we were planning our presentation, April and I joked to Abe that we were going to model our slides on a Wes Anderson movie. We’re big fans of his quirky visual style and thought it might be an appropriate look and feel for Portland. 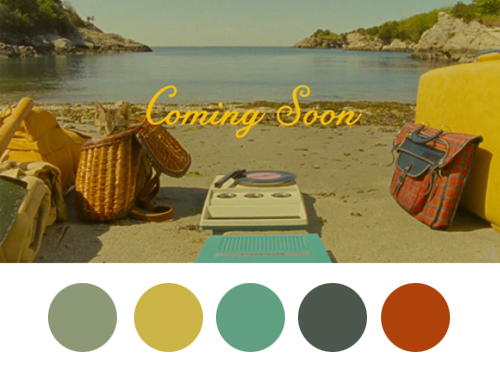 Thanks to April’s fast-as-lightning investi-googling skills, we ran into this fantastic Wes Anderson Color Palettes Tumblr and decided to use the color scheme from Moonrise Kingdom. We also decided to lift an additional color from Suzy’s dress, which gave us some pink for highlights and a fun background for some of our slides. The fonts we used were Josefin Sans and Damion, both of which are available as Google Fonts (JS | D) as well as free desktop downloads (JS | D), which is a must if you want to coordinate your handout with your slides (which you know we did). Our icons (credited on the last slide) come from the always amazing Noun Project, and were just modified according to our color scheme using Adobe Photoshop. The slides themselves were created in Google Slides. You can access the published version of our Google Slides above, but if you’re interested in adapting them, download them from the Librarian Design Share Google Drive Presentation Folder. good use of text alignment for emphasis and impact. We created the slides using Google Slides and most of the images were made using Google Draw. All the fonts are from Google Fonts. Kelly did some work in Photoshop to tweak a few of the images and the spreadsheet used in slide 10 was developed in Excel. Our presentation addressed many of the challenges (new) electronic resources librarians face when starting or transitioning into a new role. We focused on workflows and how revamping and developing new processes can facilitate the building of a new professional identity and gaining respect from colleagues. You can contact Alana or Kelly for more information about their fantastic slides.